I sure do love Chic-fil-A. Chicken minis are a favorite breakfast splurge and oh, the waffle fries! I'm definitely going to miss Chic-fil-A. I don't eat fast food very often but Chic-fil-A is my absolute favorite fast food spot. There is a Chic-fil-A in New York right in the center of the NYU campus. It would be a trek but if I'm ever craving Chic-fil-A I might make the journey. Driving wherever I want whenever I want to! We are taking my car to Hoboken. Corey's parents graciously paid our outrageous garage fees for one year as our engagement party. I am so grateful. Although we will have a car (and many people don't as this is metro NYC) I still can't drive wherever I want. If I want to grab a quick coffee at Starbucks, I'm going to have to walk the five blocks. There are no pharmacy drive thrus. While I'll still have some freedom by having my car, the roads often look like the photo above. I definitely can't get in my car and drive to the grocery store or Wal-Mart three times a week when I realize I forgot something. I'm going to have to plan further in advance! There are Lilly boutiques in New Jersey and in New York. There's the Lilly Pulitzer store on Madison Avenue but they're just not the same! 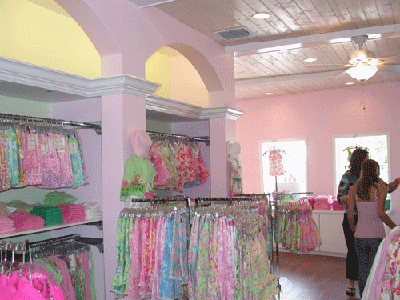 The atmosphere is completely different and I'm going to miss the southern feel of Lilly boutiques at home. 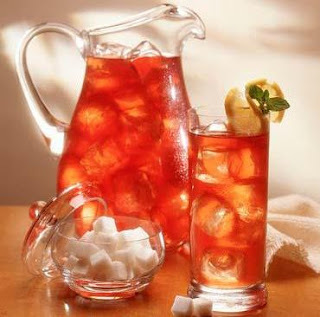 I am not an avid sweet tea drinker but I love a glass on occasion. No one makes it like we do in the south. If you order tea in New Jersey at a restaurant, what you get won't be sweet. And it won't be cold. That tomorrow is my last day of graduate school EVER! And one of my classes ends early today so I have a long lunch break. 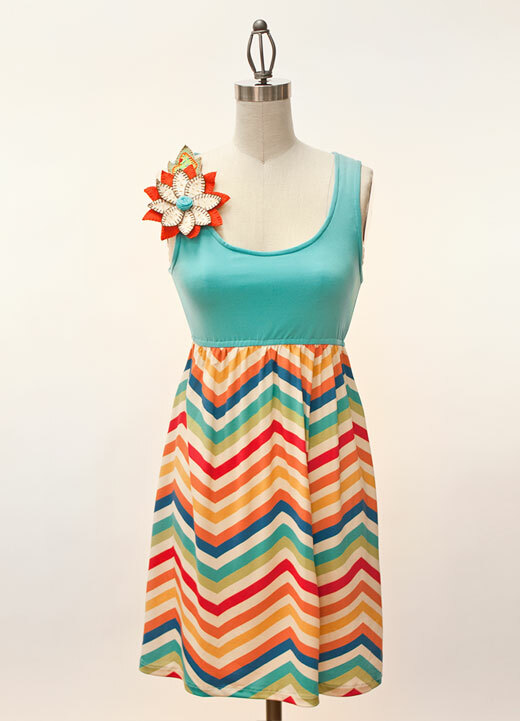 This cute dress that I purchased from a local boutique earlier this week. I LOVE the coral band and can't wait to wear it on date night with my sweet fiance. That I'm off to the beach on Monday afternoon. I'm seriously in need of some time to lounge in the sun in my cute new swimsuit, Skinnygirl margarita in hand. That I get to see my fiance in just two days! And that we will no longer be long distance. We won't have to live apart ever again! Happy Tuesday ladies! 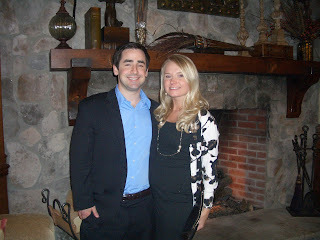 Corey and I are looking forward to our engagement party this weekend! Let's discuss some of the details. We chose a cuter font but our actual invitation gives away a little too much personal information. This is the internet after all! 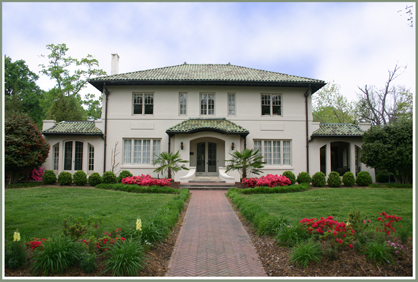 Our venue is a renovated historic home with a beautiful garden. It is a breathtaking venue and I think it will be the perfect location for this event. Want to join in on the Bridal Talk? Link up any wedding-related post or a post about your engagement party. Make sure to grab the Bridal Talk button at the top of the page and link back to Life with Elizabeth. I'll comment on all links but try to comment on at least one or two other bride's links. I'm so looking forward to this weekend. It is my last "free" weekend in South Carolina. Next weekend is our engagement party and it will be super busy. I'm trying to visit my favorite restaurants and see the people I'm closest too before I move. I had lunch with my dad at my favorite local cafe and tonight I'm headed to dinner with my cousin at my favorite Hibachi restaurant. On Sunday, I'm looking forward to lunch with my family and grandmother. I'm not looking forward to the laundry and packing I need to do. Its hard to believe that I'm moving for good so soon. After being in "limbo" for such a long time, I have to say that I am ready. I'm definitely going to miss my family and the south but I'm excited for this change. 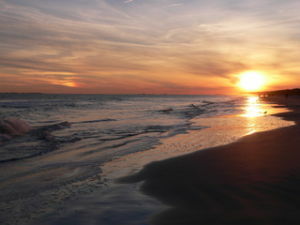 I do, however, want this last southern weekend to go by as slowly as possible. Girls, my Mary Kay pedicure set giveaway ended last night at midnight. 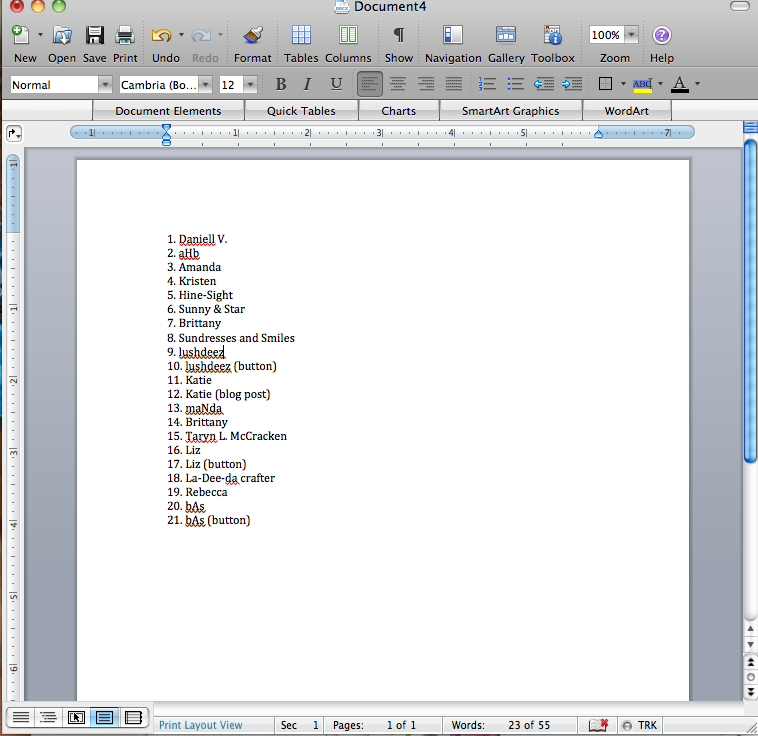 There were 21 total entries. 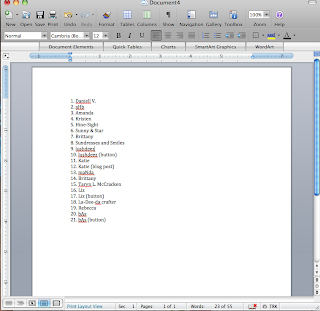 Some of you entered multiple entries with one comment so I wrote out a list of all the entries and numbered them. They're numbered in the order they were entered. 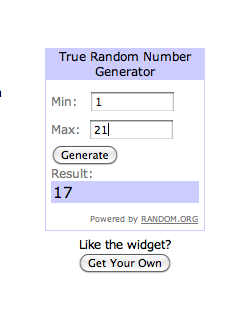 Then, I used random.org to generate the giveaway winner so that it would be completely random. Number 17 was Liz of Torts, Teeth, and a Tootsie Roll. Congratulations, Liz! Please email me your shipping info at lifewithelizabethblog[at]gmail[dot]com. Thanks so much to all who read regularly and to everyone who entered! I'm sure I will do another giveaway the next time I reach a blog goal! Did you really want the super cute Summer 2011 Limited Edition pedicure set for yourself? 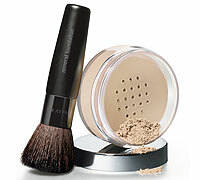 While you were entering, did you see another Mary Kay product on my website that you'd love to try? 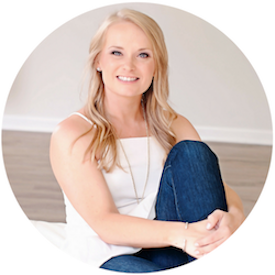 Visit my website and enter "Life with Elizabeth Blog" in the comments section of your order to receive a 10% discount, available exclusively to readers of my blog. And as always, receive free shipping! Today I'm linking up with Rebecca at Southern Charm for Thankful Thursday. 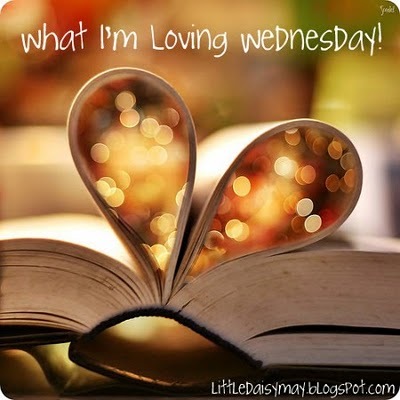 This is my first time linking up for Thankful Thursday. Today, I'm thankful that I got a good night's sleep last night. (Even though that meant going to bed at nine o'clock.) I have been completely exhausted this week because 1.) I've traveled the past three weekends. 2.) 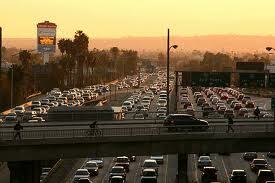 I commute 600 miles every week for class and 3.) I've been fighting a yucky summer cold. I'm thankful for the gentle reminder from the sweet graduate studies director that I had an outstanding parking ticket that would keep me from graduating. (Oopsies!) Thank goodness she reminded me! I paid it today. 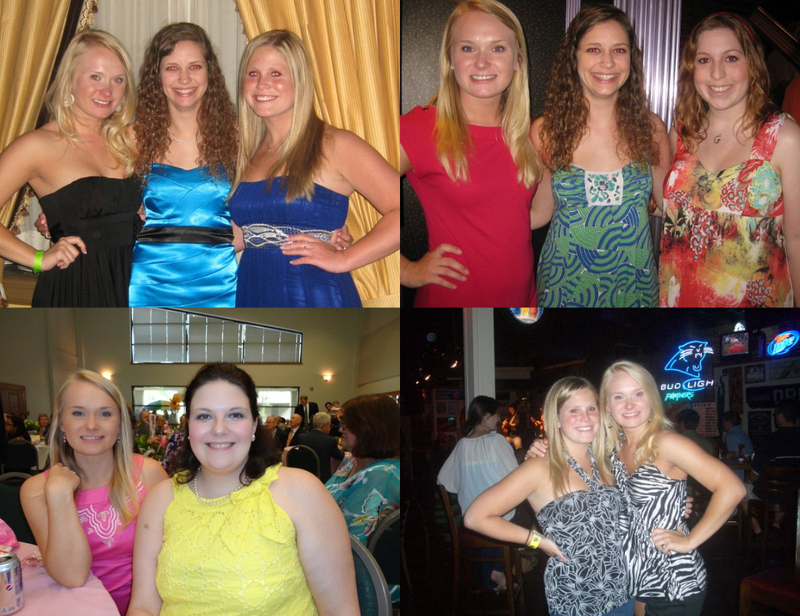 I'm thankful for my wonderful girlfriends and that I've had the opportunity to catch up with many of them this week. I'm thankful for this amazing man and that we've made it through eight months of living so far away from each other and have finally reached the end. I'm super thankful that the distance will be over in just one week and we'll be back to living in the same place! I sure do miss seeing him every day! Don't forget that my Mary Kay pedicure set giveaway ends at midnight tonight. The winner will be chosen using random.org and will be announced tomorrow. Check back to see if the winner is you! Happy Tuesday ladies! I kept you all in suspense yesterday about my wedding dress shopping in Manhattan so that I could save it for Bridal Talk Tuesday. First let me stress how important the dress is to me. As a former pageant girl for over a decade, it is all about the dress. And I like to think my pageant gowns were all fabulous so I think I had very high expectations. On Friday evening, I got in pretty late and we just had dinner and then did some catching up. Saturday, we had a nice lunch in the city then headed to Amsale. I was dying to go to this boutique because I love Kenneth Pool gowns. I tried on a couple in Charlotte and loved the way they fit my body. I haven't watched Amsale Girls - does anyone follow this? I was very impressed with Amsale. One of my maids of honor, Elizabeth, and I went and I was worried they would not take us very seriously since my mom was not there. The consultant was fabulous though and I tried on seven or eight gowns and found two that I really liked. They were simply gorgeous but at this point the dress I found at Hayden Olivia in Charlotte (that I have mentioned in several blog posts) was still my top pick. We did a little shopping and sight seeing and took a quick walk through the bottom of Central Park because my maid of honor had never seen it before. It was a beautiful day with perfect weather. A couple that Corey and I are friends with were in New Jersey for the weekend and stopped in to have dinner and spend some time with us on Saturday night. The five of us went out and it was wonderful to catch up with some friends I haven't seen in a long time - I hadn't even seen my maid of honor since Corey and I got engaged! 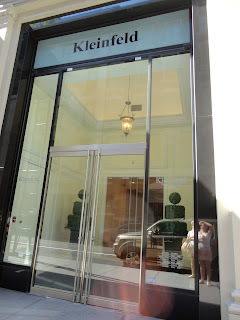 Then on Sunday we headed to Kleinfeld Bridal for my appointment. Corey's mom and sister met us there. 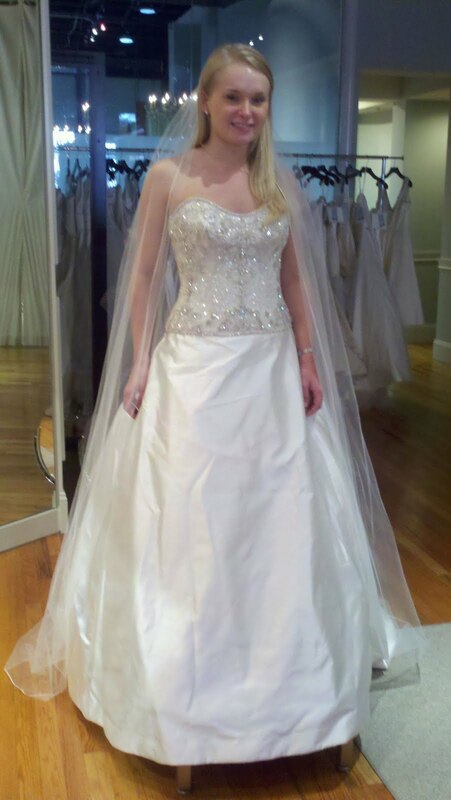 Elaine was my consultant (she is not featured on Say Yes to the Dress but was simply fabulous). It was so amazing to see the salon that I've seen featured on all the episodes I watch at the gym (and on lazy afternoons) as well as some of the consultants that I feel like I knew already. Sarah, Debbie, and Randy(!) from the show were working. I had such a fabulous experience at Kleinfeld's. Sunday mornings are very busy but I was not rushed at all. 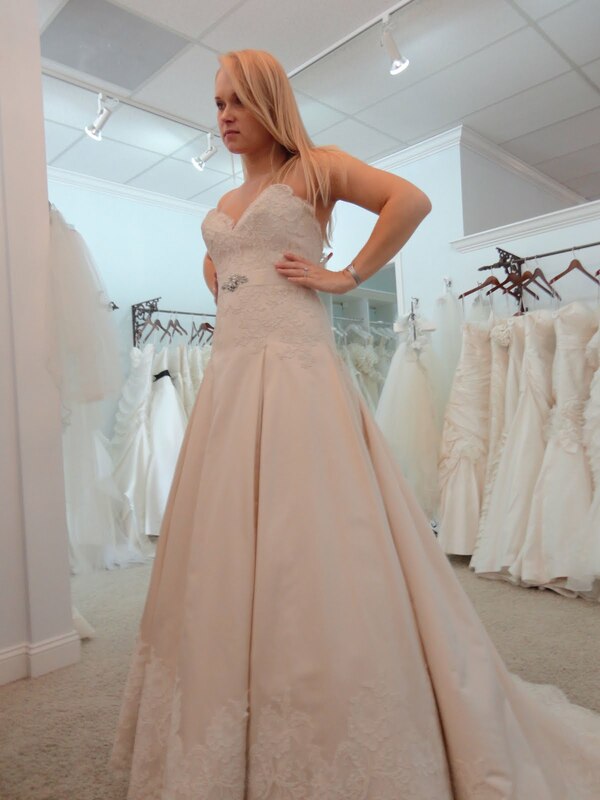 The biggest advantage I had was that I had been to three other bridal salons already and knew what silhouette I wanted as well as a few things that I did not want in my wedding dress. 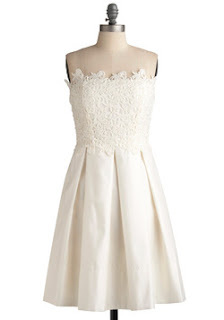 There is a dress that I've been eyeing online since Corey and I got engaged and all of my favorite dresses that I had tried on were very similar to it. At Kleinfeld, they had the actual dress I'd been dreaming of. And it was even prettier in person than it was in the photo. I could tell it was gorgeous on the hanger before I even tried it on. 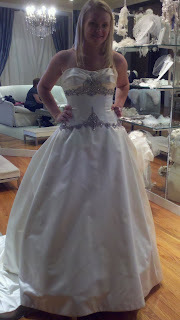 This was the first dress I tried on at Kleinfeld's and I loved it instantly. 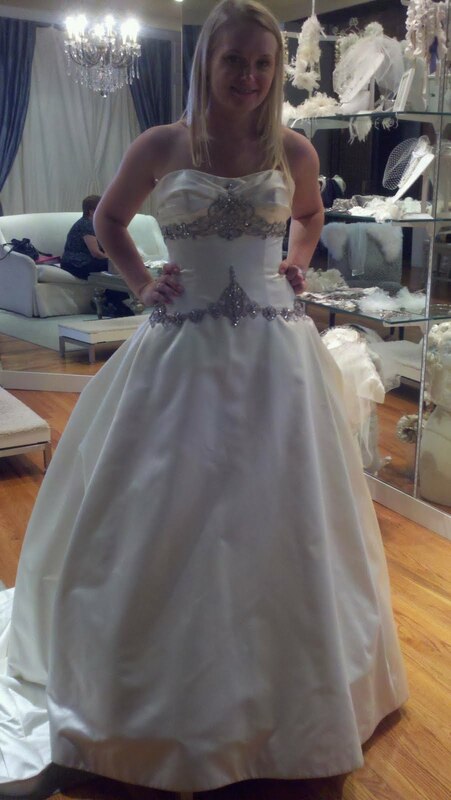 I tried on six or seven other dresses for comparison and they were all beautiful but the first dress was perfect. 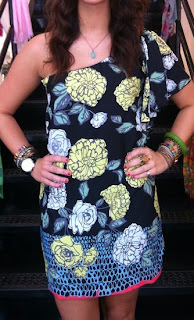 While I loved the dress I found in Charlotte (recall this post?) I felt very uneasy when I left the salon. It was beautiful but I found myself obsessing over whether it was the one all weekend long that weekend. 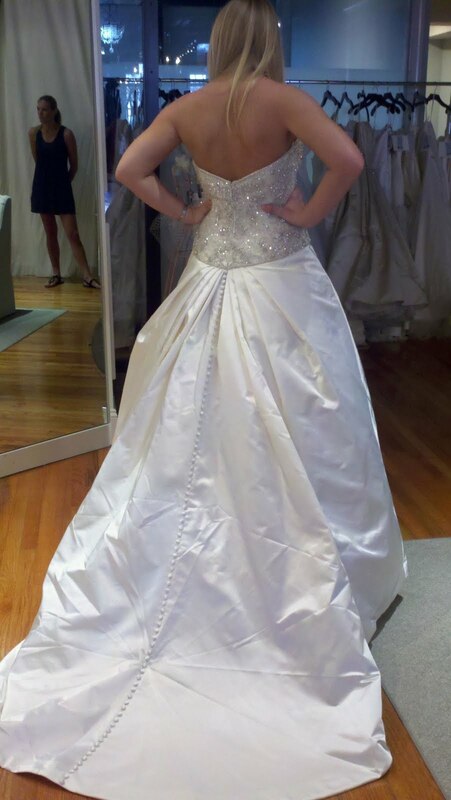 When I tried on this dress at Kleinfeld, I just knew! 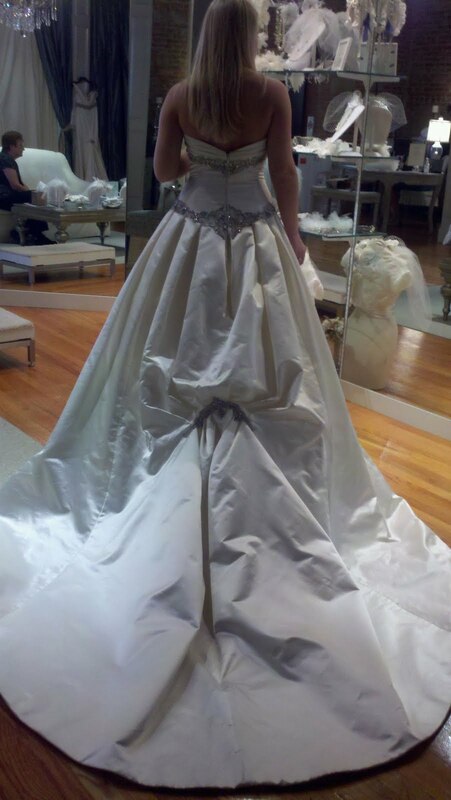 I could actually imagine myself walking down the aisle in that dress. It is so perfect that I can seriously see myself putting it back on when we return from our honeymoon just because I love it so much and already want to wear it more than once! And to top it all off, they offered me a discount off the ticket price because they were having a trunk show this past weekend. I would highly recommend Kleinfeld's. The selection is unbeatable and when I left I really felt like I had seen everything. Not only did I love my dress but I felt confident that I wouldn't come across one I liked better somewhere else. My consultant, Elaine, was patient and very helpful and the whole atmosphere of the store was friendly - not snobbish like I'd been warned to expect. I only purchased my dress on Sunday and the salon has been in contact with me to thank me for my purchase and offer answers to some frequently asked questions. I'm completely at ease because I will be able to do alterations with Kleinfeld's as well because the salon is only four train stops away from our new apartment in Hoboken. I'm returning next month to try the sample back on and choose a veil and look at other accessories. I am beyond excited! 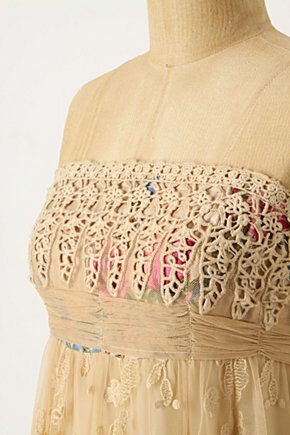 I wish I could share with you all some of the pictures of this beautiful dress. When I tried it on for the first time, my maid of honor said, "Wow! That is the most Elizabeth dress I've ever seen!" And she was right - everything about it just screams me. It is a perfect choice. Stay tuned August 2012 to see what it looks like and for more pictures from Kleinfeld's. I was so silly - I forgot to take a picture with our group (Elizabeth my MOH, Corey's sister who is one of my bridesmaids, and his mom) and with Elaine in my street clothes. I was so excited after placing the order for my dress that we hurried off for lunch and mimosas and I didn't even think about the fact that I couldn't share all the photos we took while I was still wearing the dress! I'm so excited that I "said yes to the dress" and that I'm a Kleinfeld bride! Stay tuned August 2012 to see the actual dress! 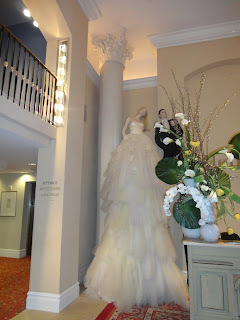 And pictures of my shopping trip to Kleinfeld's! Want to join in on the Bridal Talk? 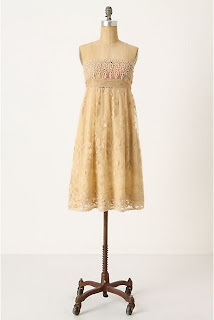 You can link-up any wedding-lated post or one about finding your dream dress. 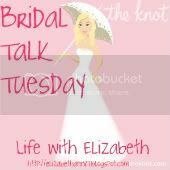 Make sure to grab the Bridal Talk Tuesday button at the top of this post and link back to Life with Elizabeth. I will comment on anyone's post who links up but try to comment on at least one or two other blogs in the link-up too to share the wedding love! Happy Monday girls! I'm linking up with Carissa today for Miscellany Monday. Want to play along? Write random and link up. I had a super fun weekend in NYC with Corey, my maid of honor, Elizabeth, and Corey's mom and sister. We went to two bridal salons (including Kleinfeld's). My lips are sealed about that part of the trip until tomorrow's Bridal Talk Tuesday though. How random is this? This is Elizabeth, one of my maids of honor. Please note her very distressed, very sad face. Then look at the shoe she is holding to see why. On Friday night, we got in very late and walked to a pizzeria only three blocks from our apartment. 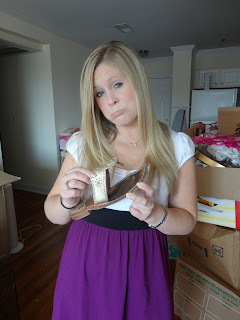 On the way back her Jack Rogers broke. At the toe thong! She was just walking along and felt a jerk and then snap! There it went. As you may recall, I had a similar incident that resulted in four stitches last month. So the verdict is in - although I did replace my Jacks with new Jacks, I will definitely be purchasing Stephen Bonannos the next time I'm in need of a Navajo sandal. I officially have nine days of graduate school left! Thank goodness because I am exhausted! And I'm ready to settle into Hoboken and get everything unpacked and organized. I can't wait to show you my impressive organizational skills. 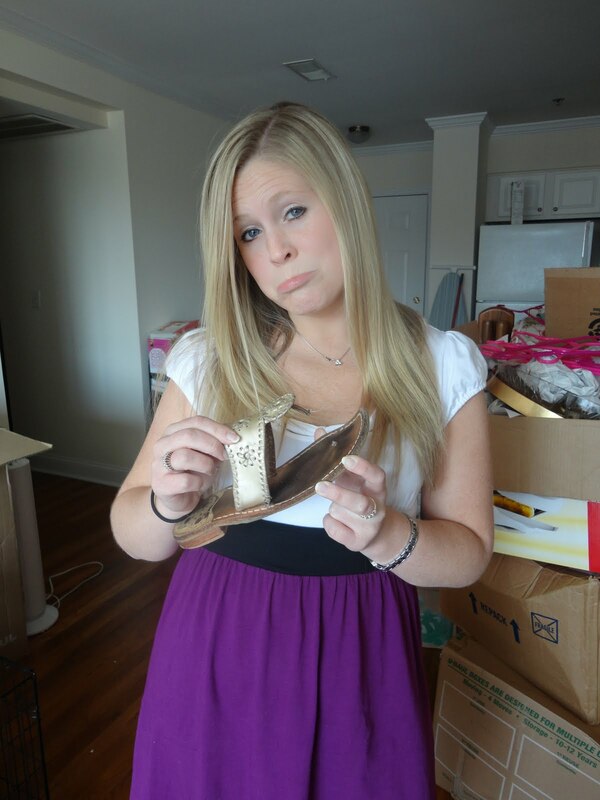 Or how I'm fitting 110 pairs of shoes into my 760 square foot apartment. 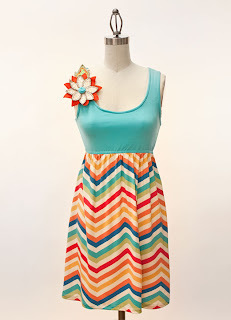 You may remember this dress from a WILW post ages ago. I ended up purchasing this cute Anthro dress for the engagement party. Hopefully I will be able to wear it for several wedding related events. I love the classic vintage look. Giveaway: Pamper those tootsies with this awesome pedicure set! I have finally reached 75 followers! 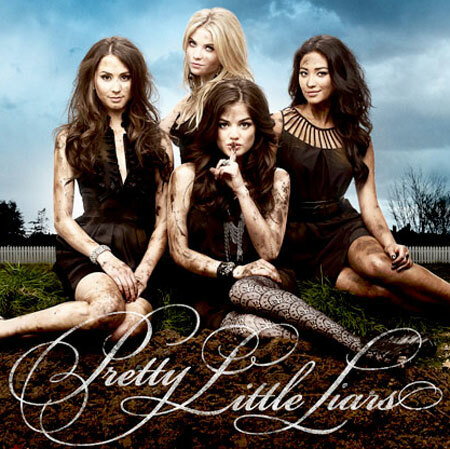 I am so excited and as promised, I am having a giveaway! The winner will be able to get their tootsies summer-ready with this Limited Edition Mary Kay Pedicure Set. Included are the Rosemary Mint Relaxing Foot Soak, Rosemary Mint Soothing Foot Balm, and Foot Brush with Pumice Stone. All in an adorable zippered bag. I have worked as a Mary Kay Independent Beauty Consultant since 2006 and I love Mary Kay's products. Our seasonal limited edition products are consistently some of the best and once I tried this set for myself, I knew it would be the perfect giveaway and I can't wait for one of you to try it as well. 1. This giveaway will be open from now until midnight, July 21. 2. The winner will be chosen using random.org. 3. To enter you must be a follower of this blog and leave me a comment telling me so and you must visit my website and let me know which product you'd most like to try (or that you already use). 4. 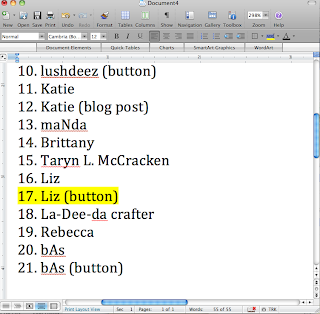 You may enter for 1 bonus entry if my blog button is displayed prominently on your blog. (Prominently means either in a sidebar or on a navigation page.) Please leave the link to your blog in a comment. 5. You may enter for 1 bonus entry if you mention this giveaway in a post on your blog. Please make sure to link back to Life with Elizabeth and leave me a comment with the link to your post. Happy Tuesday girls! I'm so excited about another Bridal Talk Tuesday! Today, I decided I wanted to write about our ceremony site. While the reception is undoubtedly the most fun part of the wedding and I do love a good celebration, the ceremony is the most meaningful. I've been fascinated by weddings my entire life. I first remember the "magic" of a wedding ceremony when I was about thirteen. Before this time, I'm pretty sure I only noticed the pretty dress. 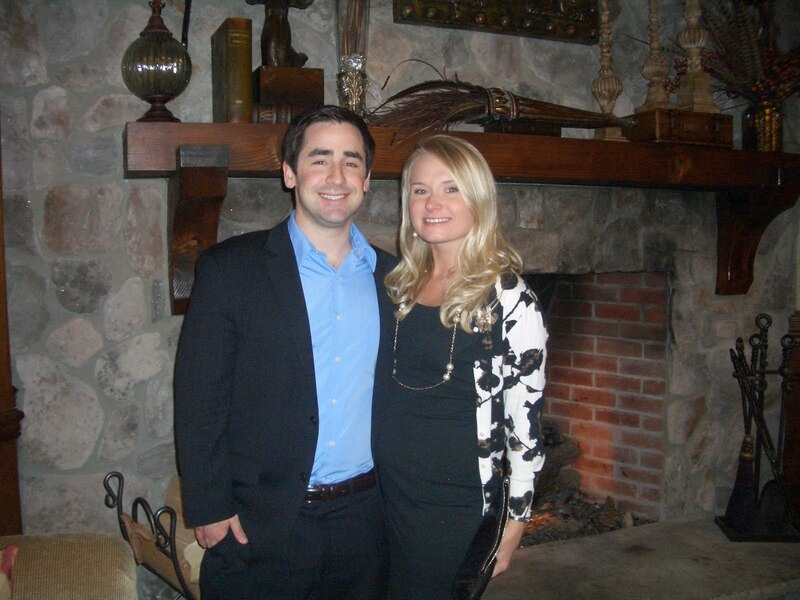 I attended my cousin's wedding and she and her fiance had been engaged for over a year and a half. They had put off the wedding because her brother, another cousin of mine, is a missionary and was working in Guatemala at the time. She really wanted him to be present for the wedding so they decided to push the date back to help accommodate this. By the time the wedding day came, boy were they ready! They were so excited and so ready to be married that they cried through their vows. It was one of the sweetest things I've ever seen and I've remembered this moment for a decade. Most of all I remember thinking, "Wow! I hope I love someone like that one day." And guess what? I do! I love my fiance more than I can put into words and I am so excited to marry him next August! 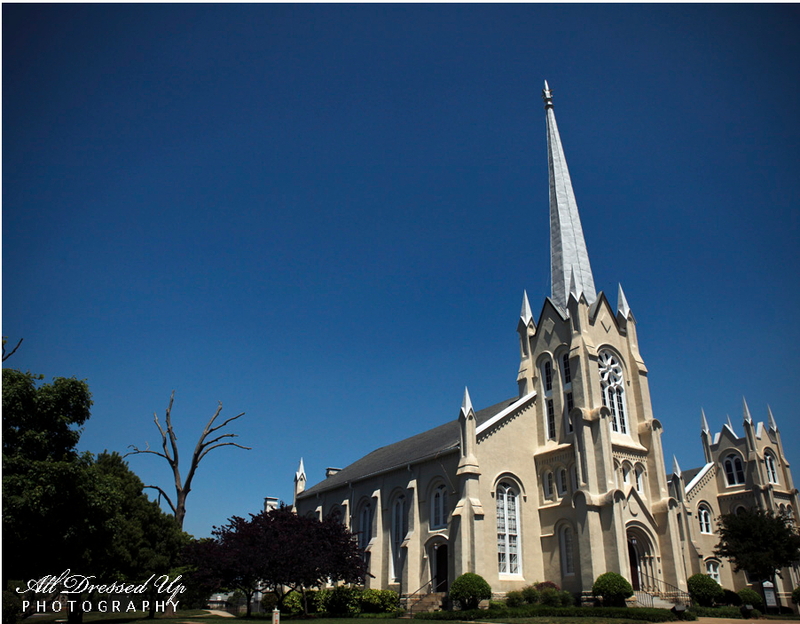 When we began planning our wedding, deciding on a ceremony site was very difficult. We needed to be near a nice hotel for out of town guests, within close proximity to the airport, and I wanted our reception and host hotel to be in an area that provided entertainment for the many guests traveling from far away. My family lives in a suburb of Charlotte and I spent many Sundays dreaming about getting married in my home church. 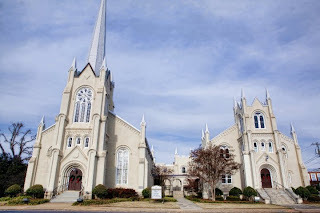 We're expecting around 100 out of town guests so I worried that the thirty-five minute commute to my home church from Charlotte would not work. Finally, though, we worked everything out, and budgeted for charter buses to transport out of town guests roundtrip from the reception site and host hotel. This made me one happy girl! 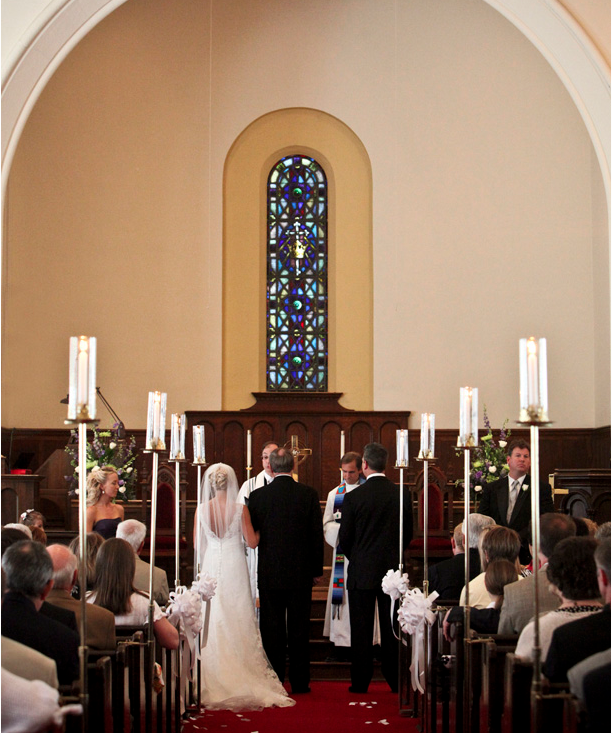 What is your dream ceremony site? 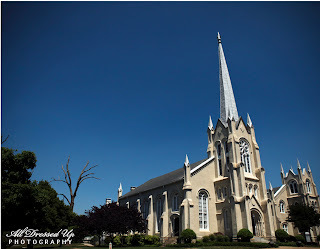 An outdoor garden wedding, church wedding, a historic mansion? Want to join the Bridal Talk? Link up here! 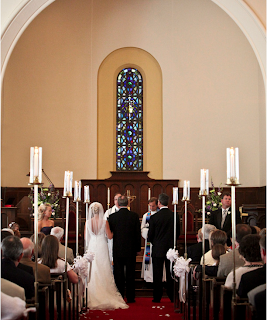 You can write about any wedding related topic or about your own dream ceremony site. 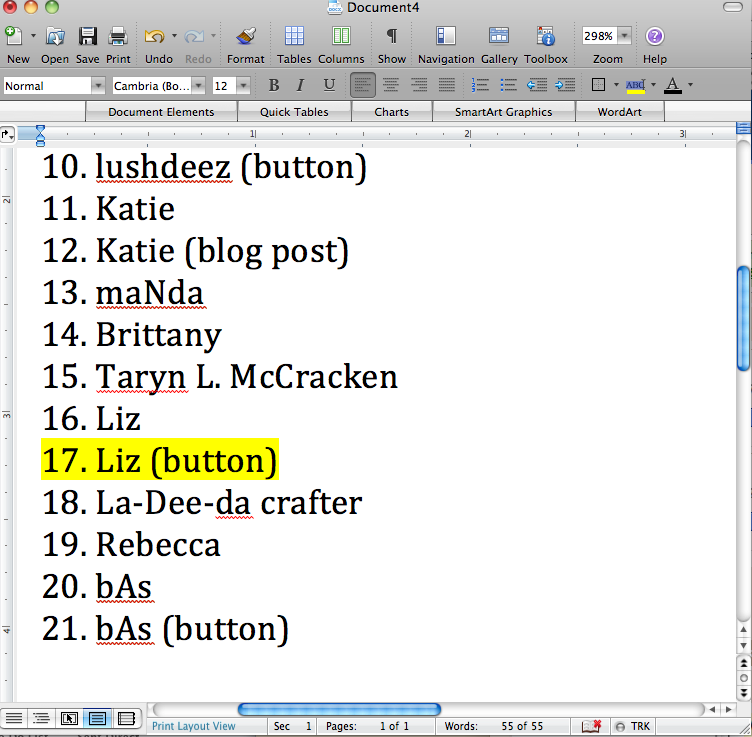 Just make sure to grab the button at the top of the page and link back to Life with Elizabeth. I comment on all link-ups but make sure to share the wedding love by visiting at least one or two other blogs in the link-up!